Pillow case-How To Make A Survival Bed Pouch. Can you picture when the power goes out in your home? We might be lucky and have a power outage in the daylight hours. You know when the lights go off, the TV is no longer showing our favorite show. The washing machine stops or the dryer stops. It’s very quiet or the power could go out in the middle of the night. You look across the street and you can see it is not just your house without lights. If you happen to have one of those deals plugged into the wall socket that comes on to indicate a power outage that helps somewhat. It will at least give you some light to help you walk around in the dark. Here’s the deal, with one of our recent power outages I asked a few neighbors about their flashlights. 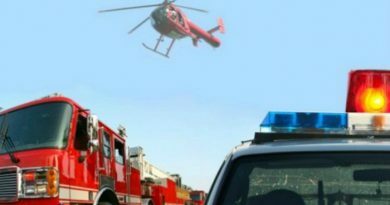 Some said they could not find their flashlights, or the batteries if they did find the flashlights. I have a nightstand next to my bed where I store my Goal Zero flashlight. It has a solar panel built in, crank and charger. PERFECT flashlight in my opinion. 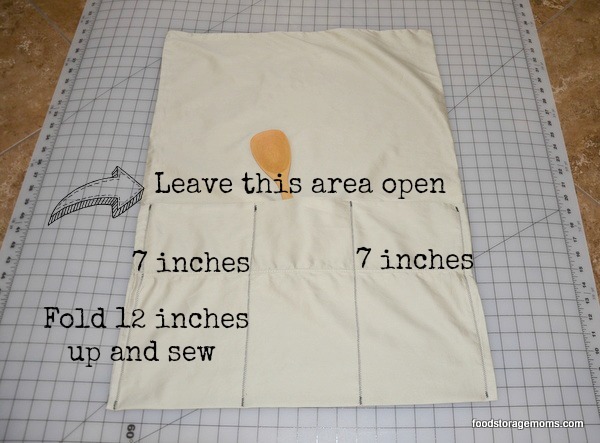 Well, I decided to show you how to make your own survival bed pouch. 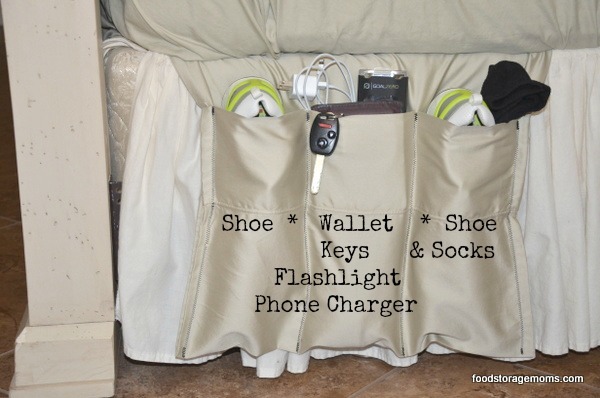 This way if your power goes out during the night and you need to leave your house ASAP you will have your flashlight, shoes, socks, wallet and car keys within inches of you. I made two of these, one for my husband and one for me. The first step is to find a king size pillowcase for each survival bed pouch. 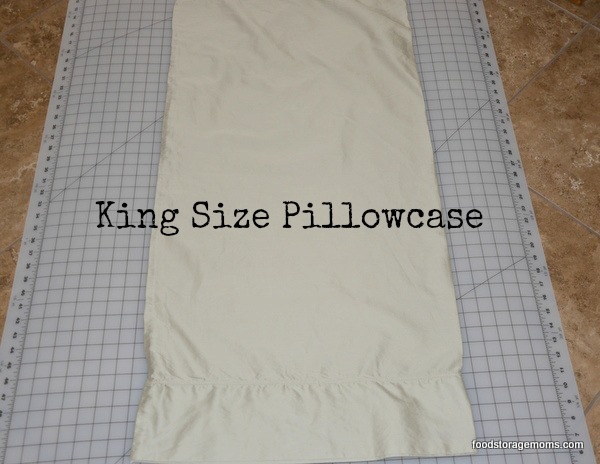 I ironed this pillowcase which is (20 inches by 39 inches) the best I could. Next, you fold the “open” end up 12 inches. You sew the sides and then measure 7 inches in on each side and sew those as well. That is enough room to hold a tennis shoe (women’s size 9). You will only sew where indicated below. You could use any fabric you have I just had two extra king-size pillowcases. The spoon shows where all the pouch openings are. 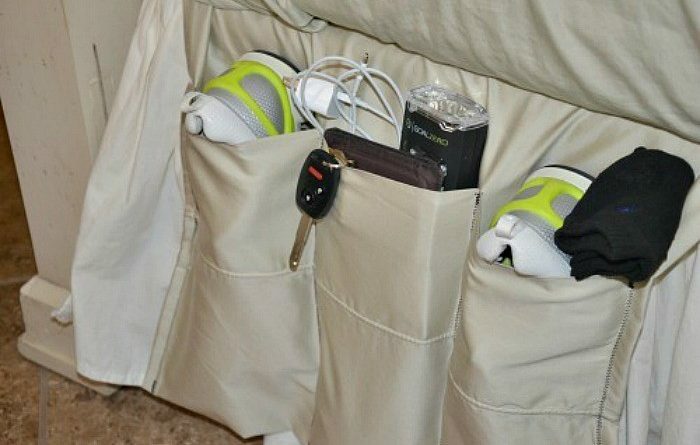 That is where you will put shoes, socks, flashlight, wallet, keys and phone charger. Of course, everyone has their own idea what they would put in their pouches. Remember flip-flops will not be very comfy if you must walk very far. This is what I call my survival bed pouch. I can at least find my walking shoes and flashlight if I must flee my home. I can then concentrate on gathering my 72-96 hour kits or bug out bag. Even if there is only a power outage I can find my flashlight. My husband will have his flashlight. I might even add my head-lamps in these. You can never be too prepared for the unexpected. The long area above the open pouches is designed to slip between your mattress and box spring. Thanks again for being prepared for the unexpected. 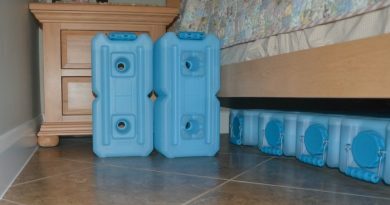 Keep prepping with water, food, and emergency preparedness supplies. The government will not be able to take care of us. We will be on our own, I promise you this. What a fantastic idea and so darn easy! Thanks for this great post. The Goal Zero flashlights are available on Amazon for $2 less than the link and are in stock. I have a set of clothes, shoes, cash, flashlight under the bed in a box. I do keep a pair of sturdy shoes and socks and gloves just under my bed and a flashlight on my nightstand. My glasses go on the night stand. At my front door, I have a coat rack that has my coat, purse and keys. I always carry a flashlight in my purse along with other EDC items. I live in an apartment and on the 2nd floor. If there is a power outage and I have to evacuate, I am MOST likely going out the front door and not off my balcony! I also have a list of EVAC items attached to my front door: BOB, Binder, Medications, etc. Something I would suggest in addition to the items you show in your bedside pouch is a pair of leather gloves. Just in case of broken glass, etc.